Gioacchino Antonio Rossini was an Italian composer most widely recognized for his 39 operas, which dominated throughout the first half of the 19th century. His other compositions include chamber music, sacred music, and solo works. Rossini was given the nickname “The Italian Mozart” due to his frequent use of song-like melodies throughout the majority of his works. He also was known as “Signor Crescendo” due to his signature orchestral scoring involving a long, steady building of sound over an ostinato figure. Revered as the “most popular opera composer in history” during his lifetime, he took existing operatic forms and styles and expanded them freely with his own ideas and rhetoric. 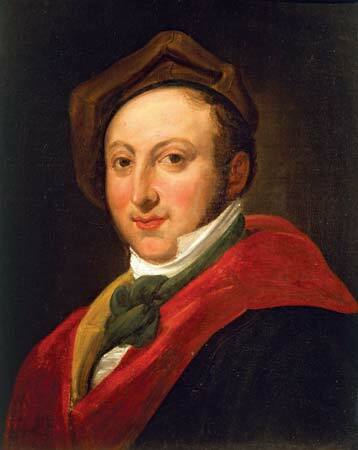 Born in Pesaro, Italy (on the coast of the Adriatic Sea), Rossini began his musical training from a very early age. His father was a horn player, and his mother was a singer. By the time he was six, Rossini was playing triangle in his father’s musical group. When his father was sent to prison in 1799 for his involvement with the French Revolution, Rossini’s mother took him to Bologna and began making a living as a leading singer in various theaters. Rossini met Angelo Tesei, who taught him sight-reading, how to play piano accompaniments, and gave him vocal training. By the age of ten, he was a singing solos in church. One of Rossini’s earliest (and frequently performed) works, Six Sonate a Quattro, was written in 1804 over the course of three days, when the composer was 12. Unusually scored for two violins, cello, and double bass, the work has been transcribed for string orchestra numerous times. Even from this one example, songlike melodies and influences of Mozart and Haydn are very present. Rossini would go on to write individual numbers to a libretto in 1805 (when he was 13 or 14), but the work would not be staged for another 6 years, thus his first opera composition premiered as his sixth official opera. He began studying the cello and took a counterpoint class from Stanislao Mattei. While he excelled at his cello playing, he struggled with the severity of the counterpoint structure, since he preferred the aesthetic of a “freer” compositional technique. Rossini received first place in a contest at the Conservatorio of Bologna for a cantata, and his first opera was produced in Venice and premiered when he was just 18 years old. He continued to write and produce operas to moderate success, including Il signor Bruschino, but it wasn’t until 1813 with the premieres of Tancredi and L’italiana in Algeri that he received international acclaim and popularity. In fact, Tancredi was so popular that the next several operas he wrote were almost considered unsatisfactory in comparison. In 1815, he received an offer from the impresario of the Naples theatre for the position of musical director of both the Teatro di San Carlo and the Teatre del Fondo, where he would write one opera per year for each organization. His arrival in Naples was met with mixed feelings from established composers and their admirers. In fact, the premiere of Le Barbier de Seville (allegedly written in only 2-3 weeks) was a complete and utter failure when it premiered (under the title Almaviva), due to indignant hecklers who sabotaged the performance by creating noise throughout the entire first act. By the second performance, the audiences became captivated and the work soon reached such popularity that no one could deny its successes. Rossini wed renowned opera singer Isabella Colbran in 1822. (Ironically, she was featured in the initial court performance of his work when first arriving to Naples). The same year they wed, they moved to Vienna so that he could direct more of his works, but quickly moved to Britain in 1823 and then to Paris the following year where he became the musical director of the Theatre des Italiens. His popularity was insurmountable and he was paid extremely well in all of these duties, receiving commissions on top of his annual salaries. His final opera, William Tell, was produced in 1829—therefore, all of Rossini’s 39 operas were written and staged before he turned 40. His last opera also happened to be his longest, and rarely is a performance given without a cut—the work runs over four hours in its entirety. The overture would serve as a model for all other romantic overtures of the 19th century. After writing six movements of his Stabat Mater in 1832, Rossini drastically reduced his compositional output. His biography essentially can be split into two halves with 1832 serving as the turning point—he would write very little after that. In his personal life, his first wife died in 1845, and he remarried in 1846. With political disturbances erupting in Bologna, he left in 1848 and lived in Florence for a few years before settling back in Paris in 1855, where he indulged his passion for cooking, having fully retired from music. He died at the age of 76 from pneumonia. Immediately following his death, Verdi proposed a Requiem for Rossini, a collaboration with 12 other Italian composers to be performed on the first anniversary of his death. Although the music was written, the performance was abandoned and a premiere was not given until 1989 by the New York Philharmonic. Originally buried in France, his remains were moved to Florence at the request of the Italian government in 1887. His estate funded the Prix Rossini, a prize awarded to young French composers and librettists and has been given out since 1881.